We are a nonprofit organization with 501(c)3 status. Have someone who loves raptors or the outdoors and can’t figure out what to get them? …buy them a gift card for an experience!! Click on the BOOK NOW button to purchase! Participate in one of our educational programs, lectures, workshops, experiences and adventures. You will making the world a better place for raptors. Are you an educator who is looking for a different approach to your biology or environmental science curriculum? Invite our Flying Team for a visit! Our programs are created using science-based knowledge and can be designed to your curriculum requirements. All programs are conducted by our Executive Director, Michele Losee, a raptor ecologist and educator. All programs finish with at least one live raptor on the glove and an informal Q&A session. Below are just examples of programs that we offer so, if you have something really unique; we can make a teaching moment out of any ideas! In addition, all programs can be modified for university or adult level programs. RAPTOR BIOLOGY – This program explores raptor anatomy using replica skeletal parts and photographs of different species to show the variances among raptor species based on their survival strategies used in the wild. Dissecting and examining feathers and raptor pellets is always a favorite way to demonstrate the unique biology of raptors. RAPTORS AND PEOPLE – This program focuses on how humans impact raptors and discussing ways the students can help raptors in their everyday lives is an excellent way to develop good environmental stewardship. WHERE RAPTORS LIVE – This program focuses on where raptors live and why all over the world. Topics covered are habitat characteristics and prey choices as well as hunting style used by various species based on prey, land cover and flight anatomy. Have a festival, outreach or corporate event you would like to make more interesting? Invite a raptor or more! Nothing inspires visitors more than seeing a live raptor up close. These types of events are more tailored to your specific event/location so, please email us with any questions. As of February 14, 2019 the Flying Team is grounded in order to moult. They will be ready to go in the Fall! Stay tuned! Are you visiting Northern Arizona or a local looking for something unique? How about experiencing raptors up close or falconry! 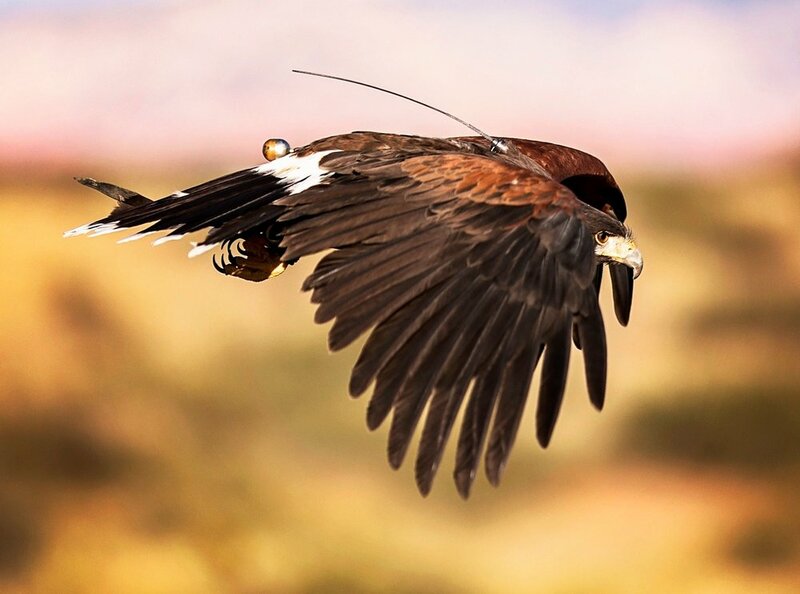 Nothing compares to experiencing nature through the lens of falconry. Enjoy being outdoors, all the while having a raptor fly to your gloved hand. Even better is the privilege of witnessing how these secretive predators hunt in the wild through our falconry experience! 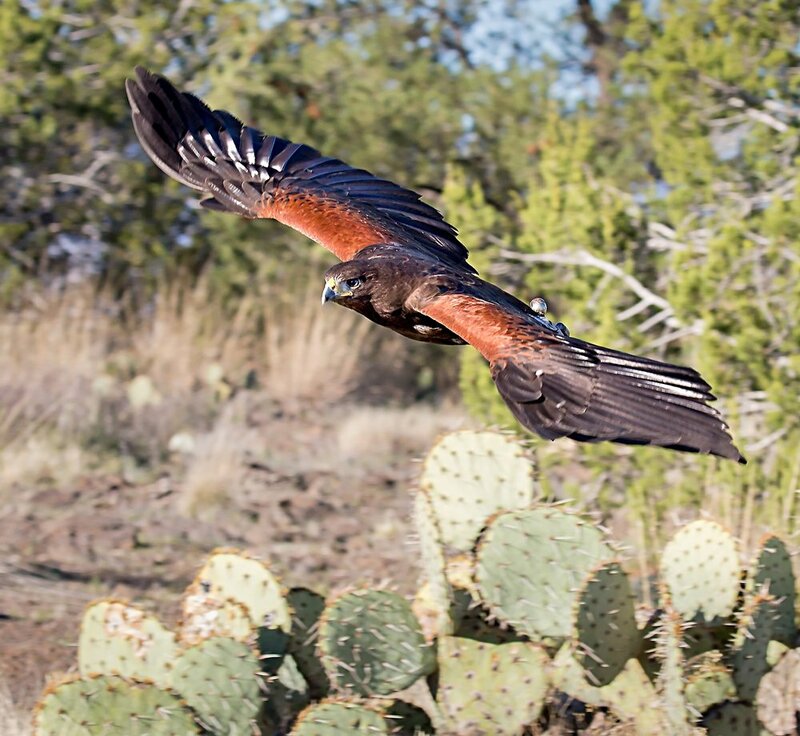 Join us in the field to experience falconry while witnessing a hunting raptor in the fields of Northern Arizona. 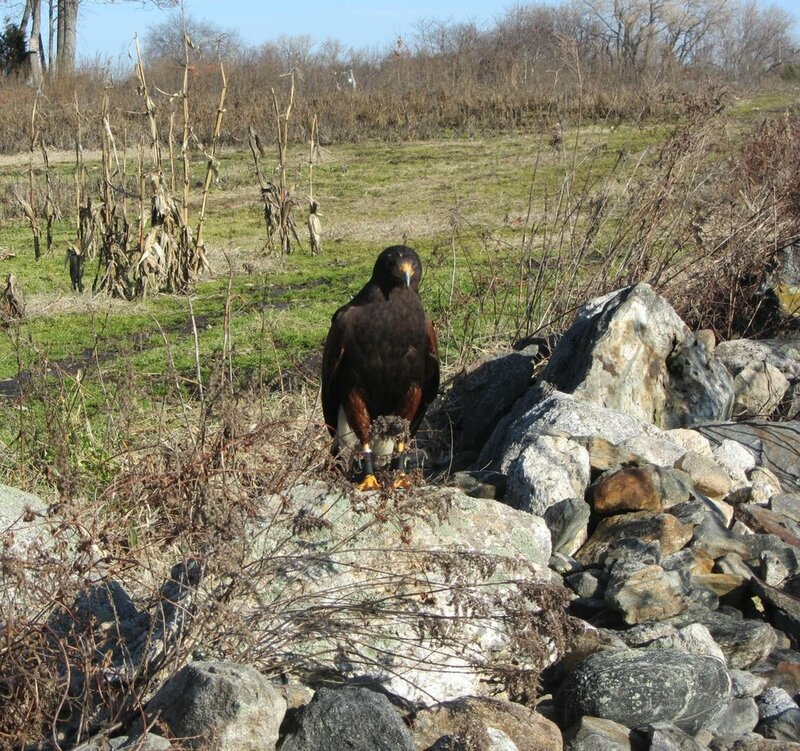 During this experience you will join our male Harris Hawk on a hunt looking for rabbits. Falconry is an ancient culture that uses a trained raptor to catch game species. Falconers are the original raptor conservationists. Many raptor species have been saved from near extinction due to the ancient knowledge passed down through many generations of falconers. Enjoy seeing the Peregrine Falcon, Bald Eagle or California Condor? Thank a FALCONER! 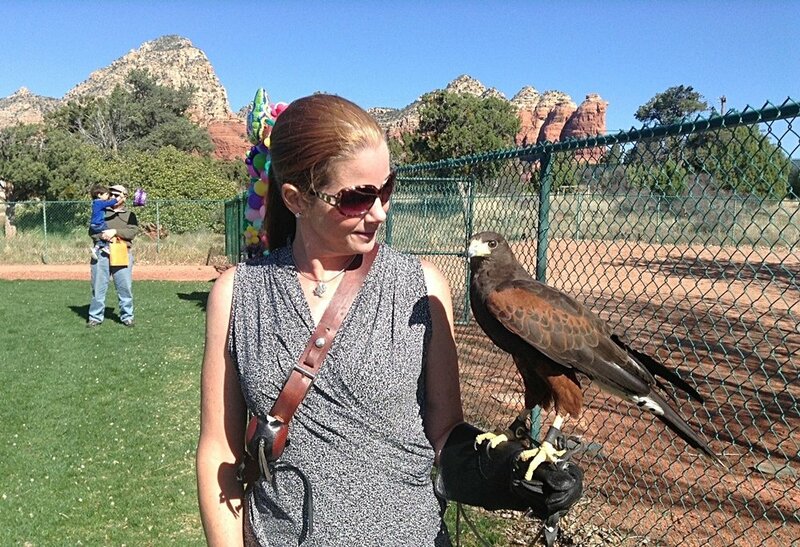 How about having a Harris Hawk be your ring bearer?! Our male Harris Hawk can deliver your rings to the best man! This would make your wedding truly unique. After the ceremony the happy couple can have photos taken with their special ring bearer and with the whole wedding party too! This awesome program includes a meet and greet at the reception for a half an hour as well. Your guests will not forget this wedding ever! Not to mention your guest can learn a little about raptor natural history and help support our mission in making the world a better place for raptors. If there is something that you need or if there is no availability, PLEASE CONTACT US! We can work together. Copyright © 2019 International Raptor & Falconry Center, All rights reserved. We would like to introduce Leroy! He is six-year-old male Harris Hawk from Lincoln, NE. In April 2018, we were approached to provide a loving family when his current falconer could no longer hunt with him in the fields of Nebraska due to knee surgery. We were honored and thrilled to be chosen as Leroy's new family! He will be loved and a just a little spoiled by his new family and friends. Leroy is an experienced hunter and is just about the sweetest little boy ever. Leroy is now flying the fields of Northern Arizona looking for rabbits!. He is doing our Raptor and Falconry Experiences so be sure to book an experience to meet him. Leroy on the hunt in Northern Arizona! Harris Hawks (Parabuteo unicinctus) are native to the southern portions of the Southwest states, Central America and South America. This means they are a warm climate species so, they have different adaptations such as lacking feathers on their lower legs. Harris Hawks are unique due to their social behaviors such as hunting in ‘family groups’ very much like a pack of wolves. This characteristic makes Harris Hawks very popular with falconers; however, do not be fooled into thinking they are ‘easy birds’ to fly. Because they are social, this brings a complex set of challenges for falconers … for example females can become quite aggressive if not trained correctly. We free fly all our birds! Every single bird on our flying team is flown on a regular basis during the falconry season. It is very important for the hunting birds to do just that…HUNT. This keeps them psychologically and physically fit. Every spring the Flying Team goes up for ‘the moult’. This is a time when they drop old, worn feathers and grow new ones. This is very energy intensive so, they are fed as much as they want of high quality food and supplements. This is also the time our food bill goes way up! Leroy is just a kid in a bird’s body! Leroy is a particularly social bird and is happiest when he is literally in the middle of family activities. All our birds are treated like family and admittedly are quite spoiled at times. At IRFC, our birds’ well-being always comes first and every single decision we make is in their best interest. They work hard for us so, we love them harder! Finley is a male American Kestrel (Falco sparverius) hatched on June 7, 2017. When he was born, he only weighed 10g! That is a third of an ounce...that is tiny! Do not assume this tiny falcon is tiny in personality; Kestrels are notorious for their 'eagle-sized' attitudes! Finley does not disappoint in the personality department! He is full of it; in fact, his name means ‘fighter’ in gaelic. American Kestrels are North America’s smallest falcon species and mostly found in open grasslands. They prey on insects, small rodents and birds. American Kestrels are experiencing a considerable decline in their populations across North America for reasons still unknown. They have declined by 60% in Northern Arizona. We are part of the American Kestrel Nest Box Partnership in order to encourage the public install nest boxes and to educate people about this species. Finley preparing for his presentation for our American Kestrel Partnership! Finley travels all over Northern Arizona educating the public about American Kestrels, when not hunting grasshoppers of course. Finley is an expert grasshopper slayer and loves flying the fields of Northern Arizona. You should join him!! If you would like to help Finley’s wild counterparts put up a nest box! Go to the resource section of this website for plans or contact us for a kit that you can purchase for a $25 donation. Quinn with Michele looking for jack rabbits. Quinn is a female dark-morph Ferruginous Hawk (Buteo regalis). She is the newest member of the IRFC Flying Team! She came to us in December 2018 from another falconer who had some time constraints due to starting graduate school. We are her 4th home so, we are thrilled to be her forever loving family and will keep this ‘Beasty Princess’ busy in her new job! She was wild trapped by her first falconer as a ‘brancher’ in Utah in spring of 2014 so, Quinn will be five-years-old this spring. She is considered a ‘soft imprint’. This means she knows she is a hawk but was exposed to humans at a young age; therefore, has a fondest for human company as well. She is a dark-morph so, she does not look like a typical Ferruginous Hawk…she is darker! This is a genetic mutation. Ferruginous Hawks are super cool! They are our largest hawk (Buteo) species in North America and are considered a specialist. They have a narrow range that encompasses the western North American prairies. They prey almost exclusively on prairie dogs, which is why they have such small feet for their massive body size. You cannot have big feet if you need to catch prairie dogs in their holes! Weighing in at 1900g, which is nearly five pounds, Quinn is a BIG girl! Which is why we lovingly call her the ‘Beasty Princess’. The Ferruginous Hawk is a ‘Species of Conservation Concern’. This means this is a species at risk! This mostly due to their narrow range and the lack of research data on this species. Northern Arizona is lucky enough to be one of the few regions that has this species year-round. You will have to come meet this special Beasty Princess in person at one of our events or book one of our experiences! Quinn, the bed bug, while staying in a hotel for a jack rabbit hawking trip. She hates having her photo taken. Quinn will be on duty for our raptor and falconry experiences in the fall. Quinn is a very sweet girl but Ferruginous Hawks are notorious for being stubborn and their difficulties in training. We hope she will be our jack rabbit hawk in addition to educating the public about her super cool species! She is on duty now for education programs and outreach. Check back because we will have more/better photos as well as videos of Quinn. Also, you can meet her through booking one of our experiences and/or programs! Coral is an 8-year-old, female Harris Hawk. She is captive bred and born in Gloucestershire UK. Yep, a native species from the Southwest USA originally from Britain...weird indeed. She has traveled all over since arriving in America, all the while educating and showing off to the public from New England to Northern Arizona. When not flying around the fields of Northern Arizona, she LOVES her doing her job educating the public about her wild counterparts. Now that Finley, Leroy and Quinn are trained in their jobs, Coral is somewhat retired from public life. She will do some educational programs as needed. For the most part she is just Michele’s personal hunting bird. We are a non-profit organization that is devoted to the conservation and understanding of raptor species worldwide. Our mission is to make the world a better place for raptors through education and science. Our vision is to improve awareness and appreciation of raptors globally. We offer raptor and falconry experiences using trained raptors in order for the public to not only enjoy these beautiful birds up close but to have a better understanding of the role in our ecosystem as an apex predator. The ancient culture of Falconry has played a pioneering role in raptor conservation and the Center will conserve that heritage through ethical practices and education. We provide presentations about the history of Falconry and workshops for those who wish to explore the culture for themselves. Northern Arizona is in desperate need of a raptor rehabilitation center that specializes in raptor medicine. Currently, Northern Arizona raptors that get themselves into trouble have nowhere to go to get competent medical attention. In addition, the closest avian veterinarian is three hours away; therefore, even our healthy birds have to endure a six-hour round trip just for a simple check-up. Our major goal for the Center is to build a state-of-the-art avian hospital for injured/sick raptors to seek treatment and to have a teaching facility for those that are specializing in raptor medicine. Our ultimate vision for the Center is to be specialty center devoted to raptor species from all over the world for the public to visit and enjoy. For more than 17 years, I have been involved in raptor rehabilitation, conservation and public education with various organizations. I love all things raptor. 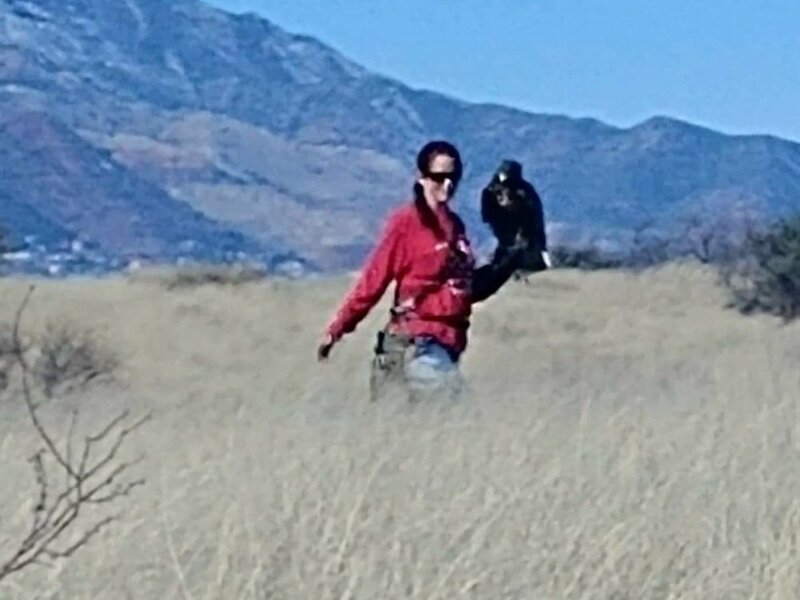 When I am not studying raptors, I am flying raptors in the fields of Northern Arizona and when not doing that, I am educating the public about raptors. I love all birds but, I have decided to devote my entire life to making the world a better place for raptors. I founded the International Raptor and Falconry Center as decade long desire to fulfill that goal. We cannot think of a better young person to champion our mission and inspire young people to care about raptors as well as lead the future generation of raptor conservationists. She is a leader beyond her years and we have no doubt she will carrying out the mission of making the world a better place for raptors with conviction. 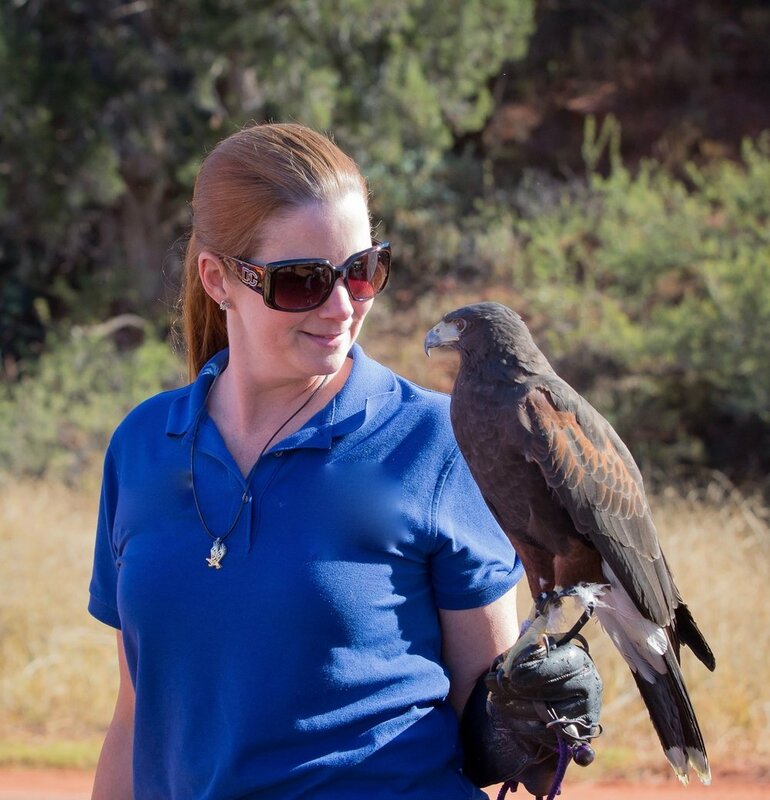 Danae has shown a passion for raptors and strong interest in caring for them that can’t seem to be squashed. Her maturity and desire to learn is quite impressive. When she is old enough to start her falconry apprenticeship, which I’m sure will come no later than exactly ON her 12th birthday, it will be an honor for me (Michele) to sponsor her and witness her join the ranks of the very few female falconers. Playing an active role in Danae's ambition in becoming a falconer and avian veterinarian, I am thrilled to take on the role of President of IRFC! Jeanna is a local business owner and a seasoned organizational leader! Jodi comes to IRFC as an accountant and great love of crunching numbers!